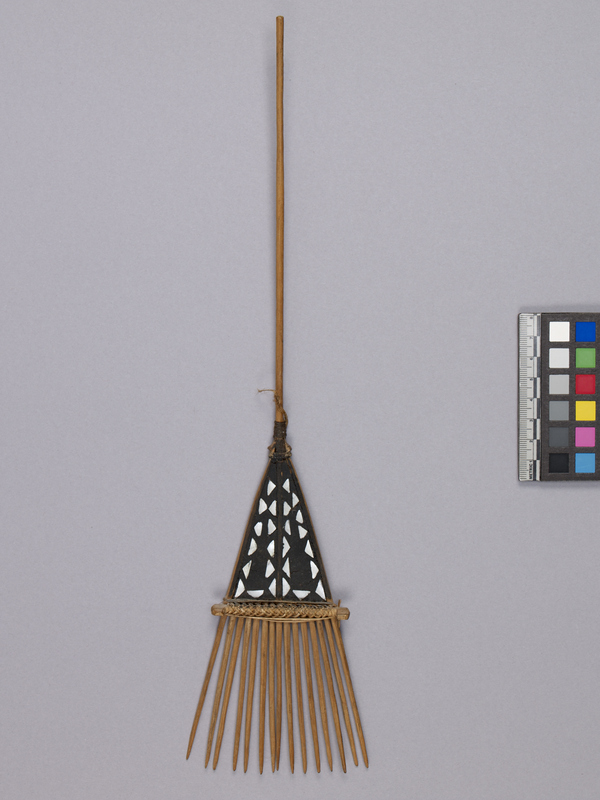 Item number 3092/11 from the MOA: University of British Columbia. A flat comb with 15 prongs, made from light brown sticks that are thinned at the top end, and tightly held together by a cross-bar weave. The comb is triangular in shape. The upper end is covered with a black substance and inlaid with mother-of-pearl triangles, the lower part constitutes the prongs. The comb is attached to a long thin handle, which has a small piece of twine attached to it. Purchased by the donors from an antique dealer in London, UK in 1968.
wood, mother of pearl shell and reed grass ? wood shell, mother of pearl grass, reed ?